Bees had been buzzing and the birds tweeting for weeks, the grapevine is the fastest form of communication known to mankind, achieving greater speed even than that which the information superhighway of the newest and most sophisticated overclocked chipset can obtain; “The Provincial Grand Master was coming to Leigh”. Tony Harrison had visited Leigh a couple of times already this year, purely in a social capacity, to enjoy the special warmth and hospitality that the Provinces smallest group provides, but this time he was to be here on business. An installation ceremony. Tony (left) congratulates John on attaining the chair of Lilford Lodge. The fortunate and grateful recipient of this special honour and privilege that had been bestowed on the Leigh Group was to be Lilford Lodge No 3022 headed by Tony Roe, who had held the warrant for two years and was about to pass it on as he had received it ‘pure and unsullied’. The regular visitors new that they were in for a treat as Tony’s ritual is second to none and is testament to the support, attention to detail and regularity that the more experienced members of the lodge have provided during his preceding formative years. Commencing the evening’s proceedings, Tony warmly welcomed the visiting brethren to the installation ceremony before opening the lodge in all three degrees. 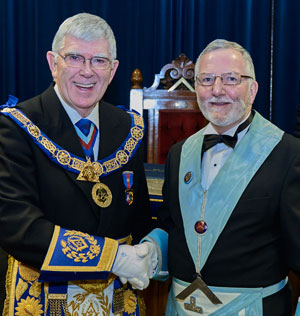 After the initial lodge business was completed, the director of ceremonies, Albert Marshal, admitted Provincial Deputy Grand Director of Ceremonies Malcolm Bell who quickly informed everyone that the Provincial Grand Master Tony Harrison stood without and demanded admission. Tony Harrison was then admitted into the temple accompanied by Assistant Provincial Grand Master David Ogden and a full provincial team which consisted of Provincial Senior Warden John Karran, Provincial Junior Warden Barry Dickinson, Provincial Grand Superintendent of Works Chris Mahoney, Provincial Deputy Grand Superintendent of Works Andrew Hardman, Provincial Grand Steward Nigel Isherwood, all guided and accompanied by DC Malcolm Bell and his Assistant Director of Ceremonies Gary Smith, to complete the grand entourage the accompanying grand officers; Geoff Bent, Malcolm Parr, Len Hart and Leigh Group Chairman Jonathan Heaton, all were preceded into the lodge by deacons Bob Duff and Norman Hilton. 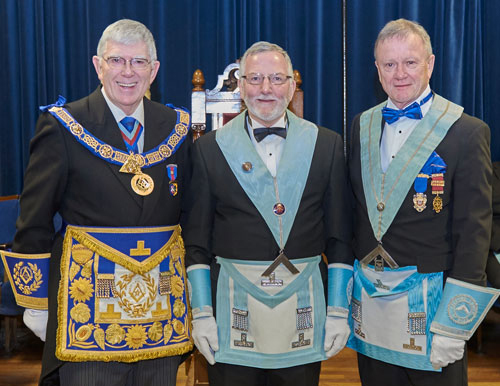 Tony (left) with newly installed master John (centre) and installing master Tony. Following the salutations, the WM resumed work in the second degree. Bidding farewell to the brethren of Lilford Lodge, Tony was generous in his thanks for all the support he had received over the last two years from the lodge members. At this point Tony asked that John Karran and Barry Dickinson adopt the positions of installing senior and junior wardens which they of course accepted with pleasure. The master elect John Galbraith was formally presented to the lodge by Albert and John proceeded to recount the obligation of a master without stumble or stutter. Johns father-in-law Peter Thompson, who was passed earlier in the year, would have enormously proud of John’s work. There followed an accurate and measured ceremony of installation worked by the installing master Tony Roe who did an excellent job of the ceremony, as expected, in a manner that was thoroughly enjoyed by all. As usual these days, the working tools were presented in a wonderfully accurate manner by three junior brethren: the first degree tools were presented by Len Green, the second degree tools by Phil Hallinan and the third degree tools by Eric Runcorn. John then invested his officers for the coming year in most excellent manner. The address to the wardens was similarly carried out in a superb manner by John Karran and the flawless address to the master by John Cooper. The PrGM then rose and addressed the brethren of Lilford Lodge. Following Tony’s address Albert then declared to John that his ceremony of installation was complete which prompted Tony to rise once more and issue his congratulations to John and thanks to the IPM Tony for a fantastic afternoon’s ritual. John’s next pleasant duty was to then present several cheques to Tony on behalf of the brethren of the lodge which were to Leigh Group Charities £115, MCF 2021 Festival £400, West Lancashire Freemasons’ Charity £100 and Friends of Ecclesholme £100. Tony thanked the brethren of the lodge for their generosity. Pictured from left to right, are: Barry Dickinson, David Ogden, Tony Harrison, John Galbraith, Tony Roe, Geoff Bent, Malcolm Parr and John Karran. The Principle guests then retired whereupon the lodge was then closed in due form in a thoroughly practiced manner by the newest WM in West Lancashire and everyone retired to the festive board. The toast to the health of the Provincial Grand Master was made by David Ogden. Tony responded by thanking the grand officers and acting Provincial grand officers for attending with him and brought congratulations once again to the quality of work that the brethren of Lilford Lodge had carried out. He complimented the Leigh Group on their Masonic hall and went on to stress the importance of looking after our halls. Tony again thanked the lodge for their donation to the MCF 2021 Festival. He then proceeded to pointed out that MCF habitually give approximately £1,000,000 per annum to worthy causes within our Province and then added that this year, the refurbishments of RMBI homes, Ecclesholme and Tithebarn were each costing approximately £500,000 and thus, via RMBI, MCF was giving a further £1,000,000 during this year in the Province. He then asked everyone to support the MCF 2021 Festival and to wear their Festival Jewels with pride. He also discussed membership and the new membership pathways, encouraged us to bring in good men to join our ranks but also stressed the importance of mentoring and informed everyone about ‘Solomon’, the new online information website of UGLE, and finally urged those members of the Craft who were not members of the Royal Arch to join and take that final step in Craft Masonry. A thoroughly satisfying festive board was enjoyed by all. Tony and John (centre) surrounded by acting Provincial grand officers and grand officers.